Some of the most celebrated problematic fossil organisms are the Cambrian-aged anomalocarids (Arthropoda, Dinocarida, Radiodonta, Anomalocaridae), the namesake of which is Anomalocaris canadensis Whiteaves, 1892. The genus name “Anomalocaris” means “strange shrimp”, which is ironically appropriate, because the name was given to fossil remains identified as shrimp bodies. But, anomalocarids are anything but shrimp. These creatures had medium-sized to large bodies (extrapolated up to ~3 meters long) with a head having a pair of grasping claws & short-stalked eyes & a pineapple ring-shaped mouth, plus a body with two lateral rows of swimming flaps (see animated reconstructions of entire animal). The first anomalocarid fossils (isolated grasping claws) were discovered in the 1880s from British Columbia’s Burgess Shale Formation (see summary of Burgess Shale). They were identified as shrimp bodies lacking heads (see photo below). Anomalocaris canadensis Whiteaves, 1892 grasping claw (~8.5 cm long). (YPM 35138, Yale University’s Peabody Museum, New Haven, Connecticut, USA). In general, paleontologists didn’t recognize that these Anomalocaris fossils represented parts of a much larger organism. The true nature of the complete Anomalocaris organism wasn’t realized until very rare complete specimens (see photos) were excavated from Burgess Shale quarries by the Royal Ontario Museum. 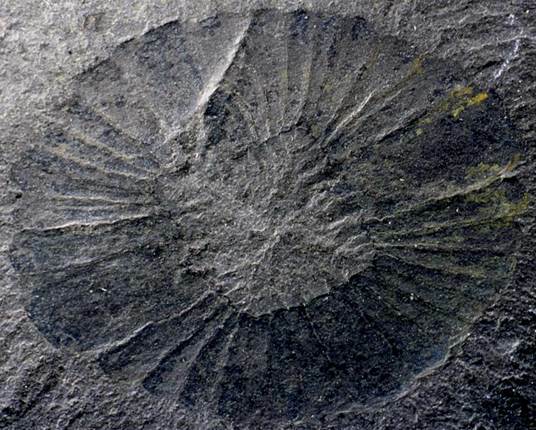 The mouthpiece of Anomalocaris canadensis turned out to be an already-known fossil previously identified as a jellyfish - Peytoia nathorsti (see below). Anomalocaris mouthpieces resemble pineapple rings, consisting of a radially arranged series of plates with inward-directed spines. Some bitemarks found on trilobites & other fossil arthropods are consistent with anomalocarid mouthpiece morphology. Anomalocaris canadensis Whiteaves, 1892 mouthpiece (~5.25 x ~4.25 cm). This fossil was formerly identified as “Peytoia nathorsti”.